Day 1 : Marrakech - Tadart-Telouet - Ait Ben Haddou -Skoura- Dades Valley. Day 2 : Dades Valley - Todhra Gorge - Erfoud - Merzouga - Camel Trek - Desert Camp. After lunch, we will pass through the towns of Arfoud and Rissani In the direction of Merzouga, home of Erg Chebbi, the tallest sand dunes in Morocco. We will arrive at the hotel in the late afternoon/early evening, where you will have some time to relax by the swimming pool and have berber tea. 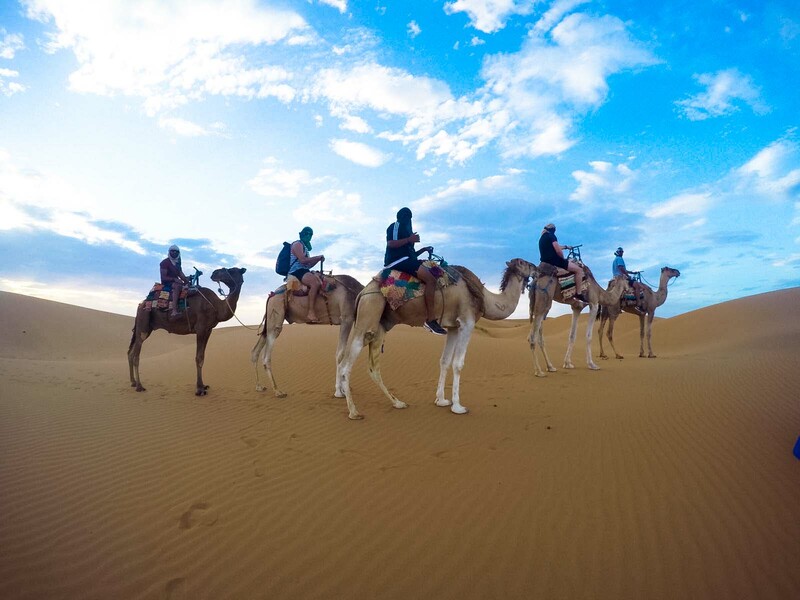 Around 5:30pm, we will ride the camels from the hotel for about one hour and a half through the desert dunes. We will arrive at the berber tents, have some time to relax, drink berber tea with nomads at the camp, and go over to the dunes to watch the sunset. Dinner will be at the camp, followed by music around the campfire. Overnight in the berber tent. Day 3 : Camel trek- Merzouga Village- Ziz Valley- Medilt- Ifrane- Fes. Before sunrise, our camel warden will wake you to ascend the dunes and find the sun emerge above the horizon. During the winter season when the days are short, we will start the camel trek and on route pause to meet the sunrise. Arriving at the hotel we will be able to have showers and breakfast, before continuing our journey to Fez. We leave Merzouga en route to Fez, passing through many places: Arfoud, Errachidia, Ziz Valley, Medilt, Cedar Forests of Azrou, Ifrane and Fez. On a good day you might be able to catch a glimpse of the monkeys that live in the forests. We will stop for lunch along the way in one of the many restaurants. Our guide will make sure you reach your chosen Riad or Hotel. Here we will leave at your Riad or Hotel at the end of the 3 days tour. We hope that you have enjoyed your taste of Morocco and all it has to offer and wish you well on your onward journey.